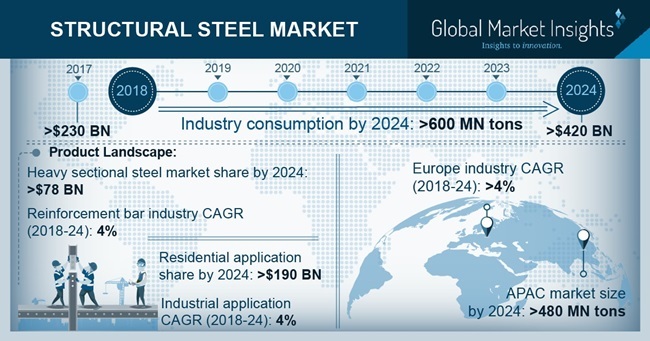 Structural Steel Market size is set to surpass USD 420 billion by 2024; according to a new research report by Global Market Insights, Inc. Growing awareness among consumers owing to benefits including design flexibility, faster completion and energy efficiency of prefabricated building projects using heavy and light sized products is anticipated to drive demand of structural steel products. Increase of infrastructure development projects in China, Japan, South Korea and India with improving standards of living and necessities for sanitation are likely to stimulate product demand. China structural steel market size is poised to surpass USD 130 billion up to 2024. Growing preference for high quality structural developments along with increasing investment in steel industry supported by adoption of sustainable mining techniques will have a positive impact on product demand. Opportunities for companies that can offer technologies to support work force productivity, energy saving will surge market growth. Global steelmakers are offering tailored building solutions that enable low-carbon-neutral and energy-efficient buildings. These solutions reduce ecological impact over the structures’ lifespan and help to extend their life expectancy through design for reuse and disassembly, thus propelling the market. Structural steel industry size from industrial application may reach up to 125 million tons by 2024. Rise in consumer awareness towards green construction material by further reducing greenhouse gas emissions will favor product demand. Heavy capital expenses in mining process, infrastructure capabilities, expensive fireproof treatment and corrosion will restrict industry profitability, thus affecting structural steel market price trends. Moreover, it being an exceptional conductor of heat, damages material in contact and causes fires which quickly spreads to further segments of building which may bound industry growth. Structural steel industry size from energy development application is anticipated to surpass 45 million tons by 2024. Optimizing costs and risks of installing large offshore platforms and different construction strategies have been developed including the use of the product, thus stimulating product demand. Structural steel exhibits excellent ductility, high strength, seismic resistance, and speed of erection. Rising application scope in non-residential applications including healthcare buildings, data centers, institutions, airports, offices and stadiums is projected to foster product demand. Increasing emphasis on technological development will facilitate faster manufacturing process with uniformity, user-friendly procedures to reduce quality issues will boost industry growth. Light sectional structural steel segment is anticipated to be over 110 million tons in the projected timeframe. It has eminent usage in residential and small building manufacturing owing to its light weight, and quick building ability without using heavy tools or equipment. Manufacturers are engaged in developing cost-efficient equipment with low environmental impacts which will foster market growth. U.S. structural steel market size from commercial application will witness significant gains of over 5%. Growing prefabricated buildings has led to increased consumption of product supported by regulations to reduce emissions and use of recycled material will contribute towards regional product demand. Global structural steel market share is moderately fragmented with major players including ArcelorMittal, POSCO, SAIL, Erdemir Group, Nucor Corporation, Voestalpine AG, Jindal and TATA. Other prominent industry participants include Evraz Group, Shaaban Group, BCI Limited, and Riva Fire.